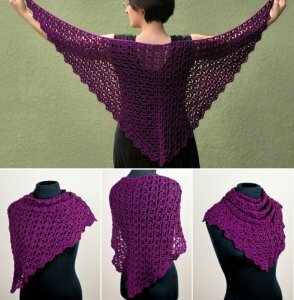 Cascading Clusters Shawl is an original PlanetJune Accessories crochet pattern by June Gilbank. Cascading Clusters is a triangular shawl with an elegant curve along the top edge so it hugs your neck and won't fall off your shoulders. The lacy squares quickly grow from the center top so you can keep crocheting until the shawl is the size you want, then add the pointed scallop border as the finishing touch. The lace pattern has a 2-row repeat, so you’ll pick it up in no time and be able to enjoy crocheting without having to worry about a complicated pattern. My lace patterns are designed to be worked with normal-sized hooks into the spaces between stitches, which means that, after the foundation row, there's no hunting for those tiny fine loops to work into, and they are a pleasure to work. Sample shawl measures 36" (wingspan) x 21" (tall) unblocked; 40" x 23" blocked. Yarn: Any yarn weight will work with this pattern; using a thicker yarn will increase the size of the stitch pattern and make the resulting shawl bulkier. Date Added: 02/04/2014 by Jamie S.
Date Added: 01/24/2014 by Monica B. Date Added: 11/22/2013 by Aimee N.